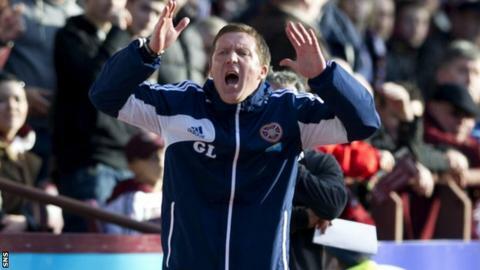 Interim boss Gary Locke has urged Hearts to put in a 90-minute performance at St Johnstone on Tuesday. He felt it took them until the second half to get firing on all cylinders in the 2-1 Scottish Premier League defeat by Motherwell. "The second half, certainly, that's the type of commitment and effort that we need, but we need it for 90 minutes," Locke told BBC Radio Scotland. "I was really, really disappointed with the start." Hearts were two goals down within eight minutes after Michael Higdon's 18th goal of the season and a Dylan McGowan own goal. John Sutton, restored to the staring line-up, headed home to reduce the deficit after the break. "To their credit they came out second half and we had Motherwell on the back foot," Locke added. "We had a great goal from John Sutton, it was just a wee bit unfortunate that we didn't create too many clear-cut chances after that. "We can't hide the fact that's another defeat at Tynecastle. But the only way we'll get out of this is by everyone at the football club sticking together. "It's important that we try lift the players and build a wee bit confidence - that'll only come with hard work and obviously getting a win."